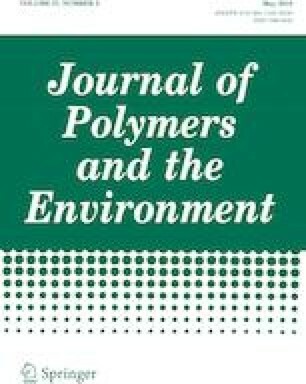 A new sustainable composite material was fabricated using CO2-based poly(cyclohexene carbonate) (PCHC) and organically modified layered zinc phenylphosphonate (m-PPZn) via a solution mixing process. Analysis by wide-angle X-ray diffraction (WAXD) showed that the interlayer spacing of the m-PPZn was enlarged to 30.4 Å. The morphology of the PCHC/m-PPZn nanocomposites was characterized by transmission electron microscopy and WAXD, which revealed that the layered materials were partially delaminated and randomly dispersed in the PCHC matrix. The enhancement of the dynamic mechanical properties of the 1 wt% PCHC/m-PPZn nanocomposite at 80 °C was approximately 114% relative to those of the neat PCHC matrix. The thermal properties of the PCHC/m-PPZn nanocomposites characterized using thermogravimetric analysis were substantially improved upon incorporation of m-PPZn. With the addition of 0.25 wt% m-PPZn into the PCHC matrix, the decomposition temperature associated with 10 wt% loss of the nanocomposites was substantially increased by approximately 24 °C compared with that of the PCHC matrix. The isothermal degradation data demonstrated that the activation energy of the composites was higher than that of the PCHC. This finding was attributed to the addition of m-PPZn to PCHC increasing the thermal energy required for degradation, thus inducing a reduction in the degradation rate and an increase in the residual weight for the PCHC/m-PPZn nanocomposites. The work was supported by the Ministry of Science and Technology (MOST) under Grant MOST 104-2212-E-005-089-MY2 and the Ministry of Education under the project of Innovation and Development Center of Sustainable Agriculture (IDCSA).